Today was my 5th day as a WWOOFer at Casalinho. The day began with my first experience as an assistant goatherd. This gave me an idea of the individual characters of goats, and plenty of exercise in chasing them away from various crops they were trying to eat. Today’s main task was mucking out the goat shed. Not as bad as it sounds and we got a good manure out of it too. What was left was used as mulch for the new cherry trees. That was followed by the feeding of the rabbits, guinea pigs and fowl. I was then given another quick tour of some of the permaculture features we had missed out on my on-arrival tour. Rabbits, chickens, ducks, goat kids …. and Serge. The bad weather (almost constant rain) of my first week at Casalinho has not detracted from the enjoyment and productivity of my stay, nor does it affect the natural beauty of the farm and its surroundings. Yesterday I made my first trip to the local pub, Cafe Martins, where WWOOFers tend to go for a refreshing beverage and wifi by the stove. It is located in the neighbouring village of Unhais-o-Velho, half an hour’s walk from the farm. After getting lost and caught in an unexpected shower of hail I caught sight of the village, cradled in between the steep rocky slopes, with distant mountains looming through the clouds, it was achingly beautiful. I couldn’t be happier with the location! Walking back to my new home after an afternoon at the bar. I had already been living in Portugal for 6 months before my arrival at Casalinho. I was working as an EVS volunteer in Peniche (near Lisbon). I have chosen to stay in Portugal because I have been thoroughly enjoying learning about the culture and language. To be able to continue doing so in a completely different part of the country, combined with my love of the outdoors, made Casalinho a perfect choice. 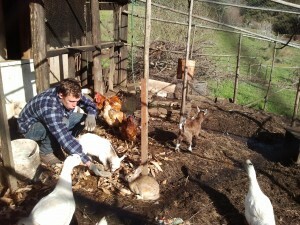 My reasons for choosing this farm began when I first saw it on WWOOF.pt. I read the description and it seemed like it was a serious project run by people who know what they’re doing. I had also heard good feedback when I mentioned Casalinho to those who had heard of it. By my 5th day I have begun to settle in, getting to know the farm and area better. I am relatively new to permaculture, but thanks to the amount of permaculture literature available from Andrea and Jeroen’s personal library, I am learning quickly. I can see my experience leading to many months pleasant WWOOFing.